Next year’s official Song of Ice and Fire calendar has just moved into production, and will be available this summer, publisher Bantam Spectra has informed me. 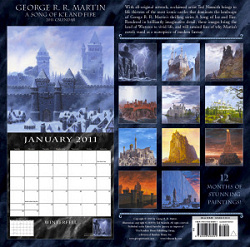 This year’s calendar is illustrated by the acclaimed fantasy artist Ted Nasmith, featuring a dozen gorgeous paintings of the great castles of Westeros. A thirteenth castle (not shown here) will be included as a double-page centerfold. Here’s a sneak peak at what the calendar will look like. Feast your eyes. Plans are for the calendar to make its debut at this year’s San Diego Comicon, so attendees should be sure to visit the Bantam Spectra booth in San Diego. By Labor Day, you should be able to find the calendar at your favorite local bookstore. But if you can’t wait, you can get your pre-order in now. For all those who still nurse bitter memories about the 2009 calendar (beautiful, but cursed), please be assured that we have changed publishers. Bantam Spectra is a division of Random House, the same great folks who publish my fantasies in the United States, and they solemnly swear that this year’s calendar will be released on schedule, without any of the delays and other problems that plagued the last attempt. 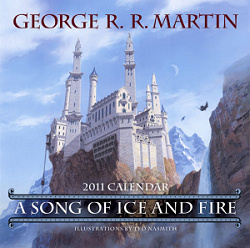 Their hope (and mine) is to make the Ice & Fire calendar a regular annual treat for my fans, and award-winning artist John Picacio is already feverishly at work on the artwork for the 2012 calendar.